Deciding where to dine on my birthday is always difficult. So many options, so much pressure. This year was stress-free. 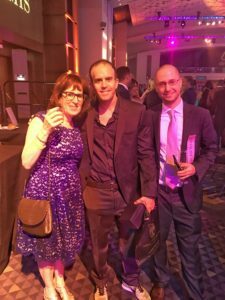 Many of my favorite DC chefs gathered at the Walter E. Washington Convention Center for the annual RAMMY Awards on June 12, and I was right there with them. As someone obsessed with DC restaurants (find me on Twitter @foodobsessed6), I can’t imagine a better way to celebrate my birthday. Sponsored by the Restaurant Association of Metropolitan Washington (RAMW), the black tie event honors the area’s restaurants and food service industry. Twenty-two awards were bestowed by local media including Leon Harris and Jummy Olabanji (WJLA-TV); Eun Yang, (News 4 Today), Tommy McFly, Kelly Collis, and Jen Richer, (94.7 Fresh FM). 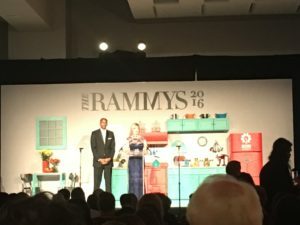 Mike Isabella accepted the Restaurateur of the Year in his first RAMMY win. Presented by the Restaurant Association Metropolitan Washington (RAMW), The RAMMY Awards Gala honors the exceptional ability and accomplishments of the hard-working individuals and organizations of the region’s restaurants and foodservice community. The selection process for the winners involved the voting public and an anonymous panel of volunteer judges, consisting of food and dining journalists, educators and foodservice industry professionals. The voting public decided the winners in four categories: Favorite Gathering Place of the Year, Upscale Brunch, Everyday Casual Brunch and Favorite Fast Bites. Restaurants must be members of RAMW to even be considered for an award.